Retired four-star Gen. Wesley Clark speaks Thursday in Harris Hall at an event hosted by Buffett Institute for Global Studies. Clark urged for immediate U.S. military support in Ukraine. 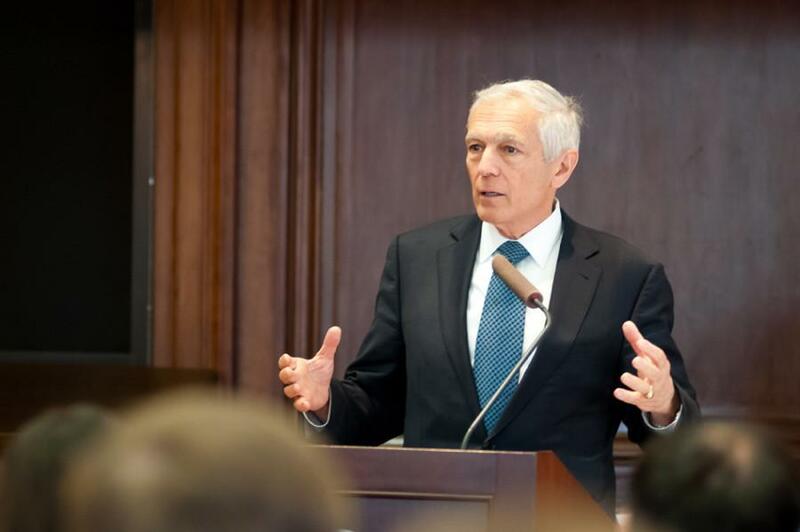 Tensions erupted Thursday afternoon when retired four-star U.S. Army general and former Supreme Allied Commander Europe Gen. Wesley Clark urged for immediate U.S. military support in Ukraine. Clark spoke to more than 60 people at Northwestern advocating military action, drawing heavily on “historical echoes” between Nazi Germany’s 1936 invasion of the Rhineland and Russia’s territorial aggression against Ukraine and occupation of Crimea. Much like Nazi Germany in the 1930s, he said, Russia is not going to stop at the occupation of Crimea, but will seek to reclaim what it considers its ancestral territory in Eastern Europe. Additionally, Clark said success in Ukraine will require winning the “information war” perpetuated by Russian President Vladimir Putin. He described Russian tactics as “hybrid warfare,” suggesting Russia relies on deception and misinformation to achieve its goals. During a Q&A session, Vsevolod Grabar, a first-year Kellogg student, was called on by Clark to speak. “You’re wearing a very interesting T-shirt,” Clark said. Grabar wore the telnyashka, an iconic white and blue striped shirt worn by Russian armed special forces. Grabar criticized Clark’s presentation as overly reliant on “conspiracies” and “lies” surrounding Putin and alleged Russian activity in Ukraine, such as the downing of Malaysia Airlines Flight MH17 by alleged Russian-led Ukrainian rebels in July 2014. Western nations and Ukraine claim the rebels are under Russian command, which Russia denies. Russia instead blames the Ukrainian government for the incident. A final report from the Dutch Safety Board, who is leading the investigation into the crash, is expected to be published in October. A heated exchange broke out when Grabar brought up Clark’s military record in Kosovo, and Clark asked the student to move to the back of the room. Clark led NATO forces in a 78-day bombing campaign against Yugoslavian forces in Kosovo as Supreme Allied Commander Europe in 1999, the first NATO use of military force without authorization from the United Nations, to stem human rights abuses. According to a 2000 report by Human Rights Watch, a human rights watchdog group, the NATO bombing campaign sought to minimize civilian casualties and only aimed for military targets, resulting in between 489 and 528 civilian deaths. Grabar asked for an apology from Clark for the civilian deaths during that campaign, which Clark refused to do. Clark was accompanied by an entourage comprising members of Ukrainian President Petro Poroshenko’s staff, as well as top Ukrainian religious leaders. The presence of religious leaders and political staffers at the event surprised the Buffett Institute for Global Studies, which organized the event, said Bruce Carruthers, the institute’s director. Carruthers said the event went well, and that the Buffett Institute aims to continue to bring knowledgeable speakers like Clark to NU. He added that exchanges, such as the one with Grabar, are important to give “a taste of the passion” inspired by these issues. Clark and Ukrainian religious and political leaders are part of a delegation from Save Ukraine Now, a non-partisan coalition that seeks to address the humanitarian crisis of more than 2 million Ukrainians internally displaced by conflict. Clark serves as the group’s chairman. Tamara Zykova, head of the group’s Representative Office, said the delegation was in Detroit and Chicago, which are central cities of the Ukrainian diaspora, as part of their Ukraine Survival humanitarian effort. She said the presence of Ukraine’s top religious leaders from many faiths is an attempt to show Ukraine is united in its fight against aggression, and that Ukraine is a nation tolerant of religious and national differences.